It was a year ago today that I met up with Larry Day and Alex Robinson from Pyramid Productions in Olds to do a shoot for the CBC documentary “When Hail Attacks”. Although there were no juicy clouds to see, it was a fun day of chatting about storms and cruising around the Eagle Hill area west of Olds. 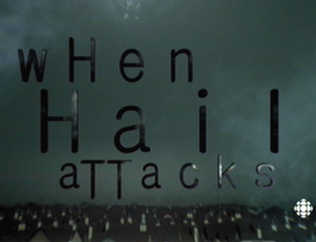 Other than the parts I was in, I really enjoyed watching the show when it came out in early August, lots of good stories and opinions on both sides of the hail seeding debate. Hail has been flying already in Alberta down around Cardston, I hope it’s not a sign of things to come. 6 weeks and it starts for real in hail alley. This entry was posted on Tuesday, May 13th, 2014 at 3:08 pm	and is filed under Weather. You can follow any responses to this entry through the RSS 2.0 feed. Both comments and pings are currently closed.